A Transistor is a device composed of semiconductor material that amplifies a signal or opens or closes a circuit, like a switch. It can cause changes in a large electrical output signal by small changes in a small input signal. That is, a weak input signal can be amplified (made stronger) by a transistor. For example, very weak radio signals in the air can be picked up by a wire antenna and processed by transistor amplifiers until they are strong enough to be heard by the human ear. 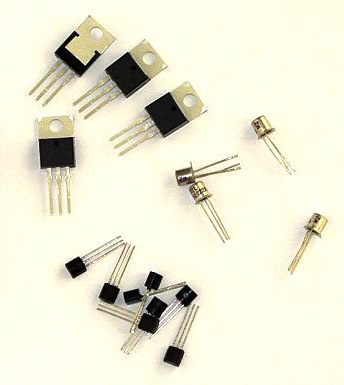 A transistor consists of three layers of silicon or germanium semiconductor material. Impurities are added to each layer to create a specific electrical positive or negative charged behavior. “P” is for a positive charged layer and “N” is for a negative charged layer. Transistors are either NPN or PNP in the configuration of the layers.